Shelley Bean: Waterfront Stamp Set--And Again! I think this is my favorite card made with the Waterfront Stamp set. I wanted to do another basic landscape but wanted it to look like the mountains I see over here in the western United States. 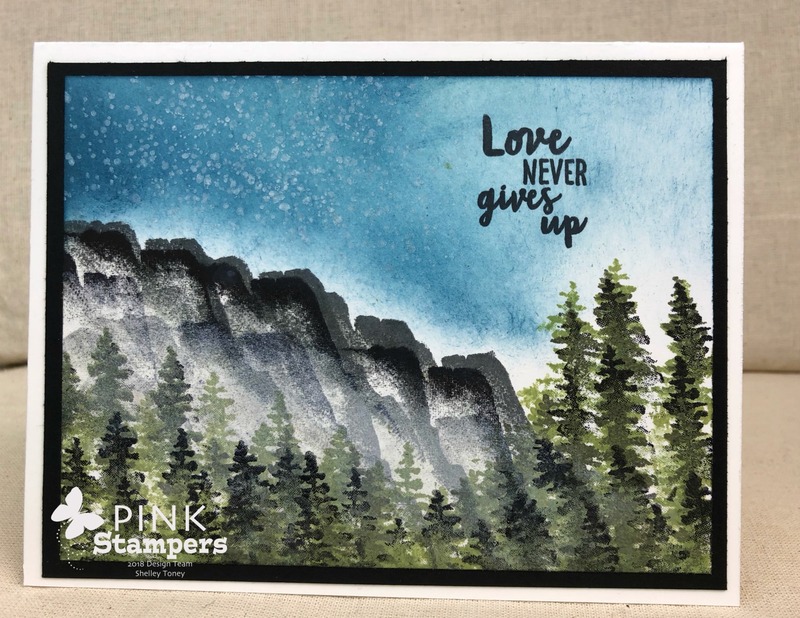 The mountain peaks in this stamp set can give this option if you change the orientation of the mountain stamp and only ink it about 1/2 way up. By turning the the stamp about 85 degrees and stamping across, you have granite mountains! It’s pretty awesome, right? I stamped them first in Basic Gray and then went over that again in Black to give some definition. I then sponged on some white craft ink to give a misty-foggy effect that would lay against the mountains. I made sure that was very dry before I started to layer my trees. Here is a tip to get the taller trees: Don’t ink the tree stumps, only the branches. This way you can layer down to make a much taller tree by repeating the same image over and over again. Also, stamp off the sides and bottom of your card so there are no tree stumps, and layer the colors from light to dark. I used Pear Pizzazz and Always Artichoke and then a few extra layers here and there in Basic Black to get that added depth to my forest. The Sky was sponged in marina Mist and Dapper Denim, with a layer of stars over the darker side made with the White Craft Ink.